I’m just about finished reading through Nicholas Wolterstorff’s Justice: Rights and Wrongs. I know it has been a while since I started, but the only time when I’ve been reading it is over a cup of coffee on my lunch breaks at work. I’ll have some comments to offer on that when I’m done. Expect to see that beginning some time in the next few weeks. 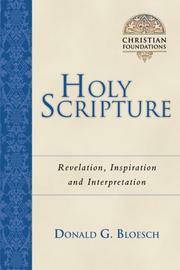 Today a new book arrived in the mail: Donald G. Bloesh: Holy Scripture: Revelation, Inspiration & Interpretation. I was prompted to get it after some of my recent musings on inerrancy. Read a blurb on the book and some brief Q and A with the author here. Bloesch says that he intends to “defend the orthodox evangelical faith from its friends as well as its enemies.” Its enemies are the sceptical opponents of Christianity, and the friends that Bloesch has in mind are (or at least include, based on my skim read) Christian modernists who defend inerrancy.